Internet Explorer 10 is a most unique and exclusive feature of Windows 8 and Microsoft is showcasing the special features optimized for Windows 8 touch interface. The same 'Internet Explorer 10' is now available for Windows 7. 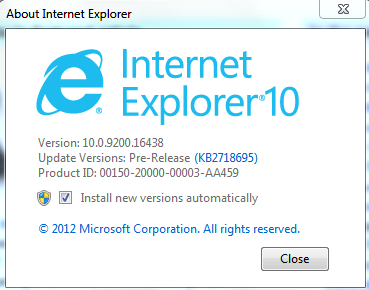 Though the application is just a preview, many tech savvy peoples are already downloaded Internet Explorer 10. If you have not yet downloaded, you can get one from here. I also installed the new and as a common user, I didn't find anything excited or even something that is different or improved from the old versions like IE 8 / 9. What ever the technology media and blogs are saying, I really find it difficult to use just for few minutes. It took too much time as compared to the standard software installation and then I found that it is because, the installation download and update the required dependencies. I was using the Internet Explore on a desktop powered with 2 GB RAM and Intel Core i5 processor. But the problem was same as it was with previous versions, the lagging scroll. I have to wait for the page to scroll up and down after I roll the mouse scroll button. Its just same in this new version also. It give me feeling of old age browsers and the main reason, I do not use it. My blog have some display issue in Internet Explorer. All other browsers display the blog completely fine, but Internet Explorer have overlapping issue. The post title overlap on the navigation bar. It is an very old issue but my lazy nature, I just expected that in new versions of Internet Explorer will resolve the issue and I don't have to waste time in updating the stylesheet. But this new and so much showcased version also didn't solved my problem. Update: As a user at HackerNews pointed out that, the overlapping issue was because of the bug in HTML of this blog, and not the fault fo Internet Explorer, I am really very sorry for blaming Internet Explorer 10 for it. I have now updated the code and the blog displays excellent in IE. Thank you for finding out the error. Though some features like 'Clear recent browser history', 'Do not track' are made easily accessible. The 'Do not feature' is enabled by default, but the move is I think more strategic than the user privacy. As the Internet Explorer is not installed as a standard software, but as a update to the original browser, it is not listed in the 'Add or remove software' list. So you have to remove it from the list of 'Installed updates' list.